Offering you a complete choice of products which include kernel cashew packing machine and nitrogen filling and packing machine. We are offering Kernel Cashew Packing Machine to our clients. It is manufactured using high-grade input factors as per the preset industry norms. 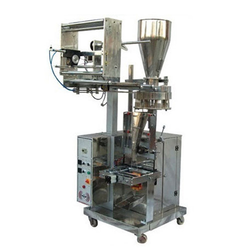 We are offering Nitrogen Filling and Packing Machine for retail market to our clients. It is manufactured using high-grade input factors as per the preset industry norms. Capacity can be customised as per requirement of clients.